This is it; the end of 2011 is near! 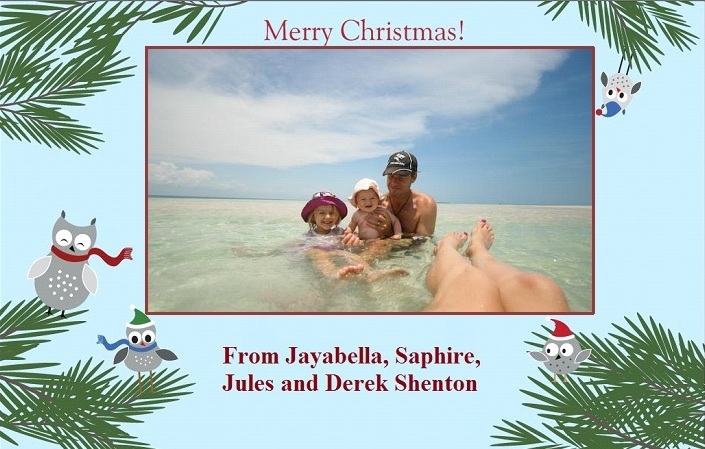 All of us at Shenton Safaris join in to thank you for a wonderful 2011 and to wish you and your family a beautiful Christmas season and a new year of peace, happiness, good health and exciting travels! We thank you as well for your constant support in our operations and your interest in our newsletters, and for sharing your photographs or simply your comments. Please continue to do so in 2012! As you can see in the above pic (Jules as per usual is behind the camera), the Shenton family celebrated their reunion at the end of the season with a short break in beautiful Mozambique. 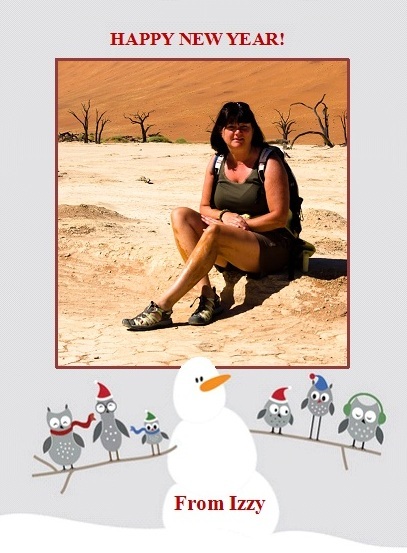 It was good… Personally, I was lucky to enjoy an amazing trip to Namibia – where the landscapes took my breath away. I have now relocated to my “city office” at home in Belgium, joining my family, and am busy preparing a marketing trip to the UK in January, along with filling the book with reservations for 2012. You can find below our December selection for the Picture of the Month, posted on our website a few days ago. The theme for the selection was night photography. Sincere congratulations to Anna-Lisa, Marc and YY for their brilliant work! Our next selections will be on the following themes: Love (January), Kiddies (February) and Birds (March). So make sure to sort through your photographs and to email them quickly to us at info@kaingo.com. Quick reminder, this competition concerns only the pictures you have taken during your stay with us at Kaingo and/or Mwamba. 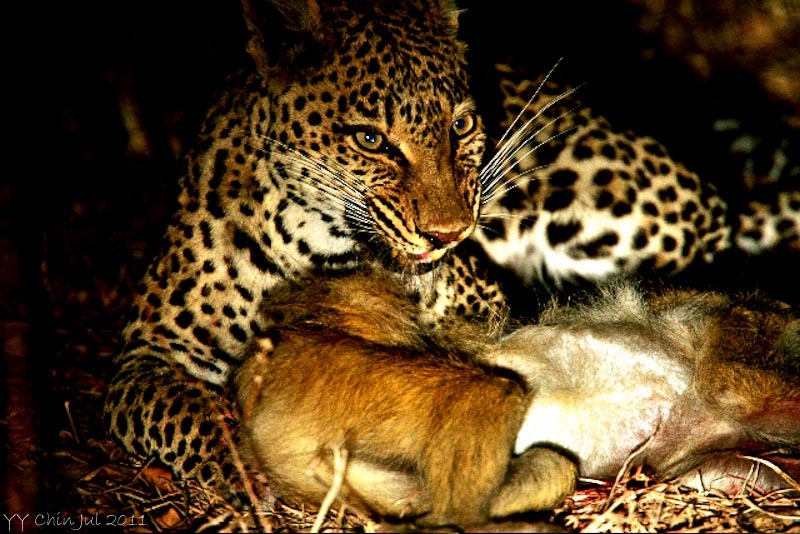 Early 2012, we will launch a Wildlife Photographic Competition for all our fans on facebook, and this competition will be open to any of your wildlife pictures, no matter where they were taken. Stay tuned for prizes and conditions. And if you haven’t done so, make sure to “like” our page and invite your friends to do so! We would also like to invite all our previous guests to send us any good video footage that you would have, as we are going to add a page to our website, to showcase these along with your photographs. The footage must be of good quality, and no longer than 4 minutes long. 4. Send the video links to info@kaingo.com so we can upload the best ones to our website and also promote them on our You Tube channel. Well, I’m afraid that’s it for us now until 2012! There are lots of pictures to chose from and they are very varied, we therefore select them according to a theme. In December our focus was night photography. I am an Italian girl 34 years old. I am an ear surgeon with the passion of wildlife photography thanks to Maurizio. We work a lot during the year but as we have spare time we like to travel in order to follow our passion. We were in Kaingo/Mwamba last summer in August and it was an amazing experience. 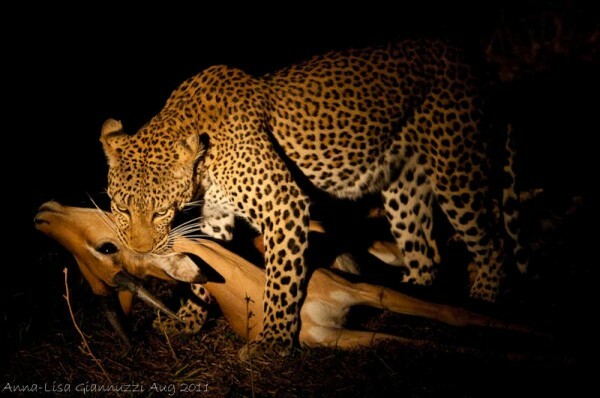 The leopard killing the impala was one of the most exiting experience in all my life and I will never forget it. Moreover, we met very nice people, in particular all your staff. Thanks to everybody and see you in the next future!!! Settings: Nikon D300, 1/60 sec at f/5. Focal 135mm. ISO 3200. I started to embrace photography over 35 years ago, back in the old days of film. I enjoy all forms of Nature photography, with a passion for African wildlife in particular. 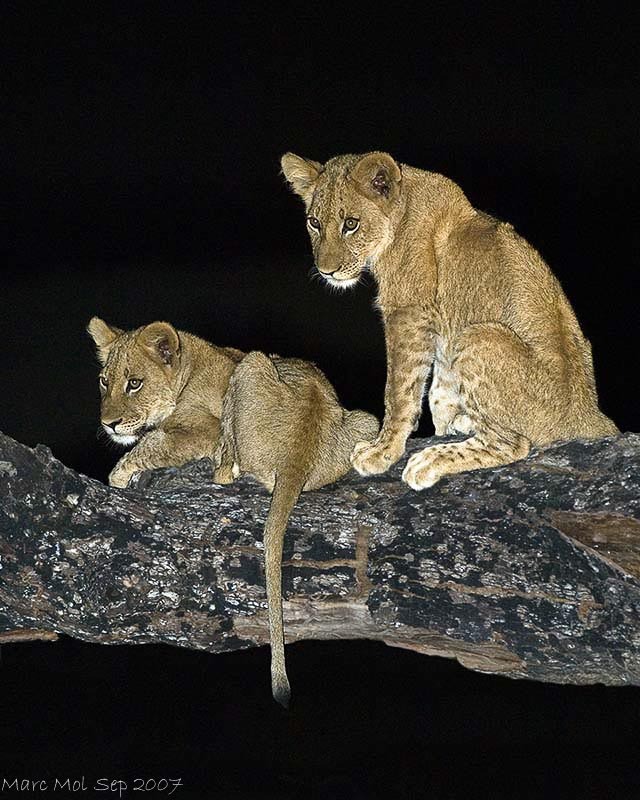 This image is entitled: Waiting for mum’s return, We found these two (of 6) four month old Lion cubs patiently waiting for mum to return from a hunt.This image was taken on my first trip to Kaingo in September 2007 and I have just returned from there experiencing some great predator viewing during the hot and exciting times of late October. Settings: Nikon D2XS, 1/250 sec at f/4. Focal 300mm. ISO 400. Y Y Chin , an avid photographer as well as traveler to off the beaten track places, is a director of a large commercial Bank in Malaysia. He also sits on the board of a Life Assurance company and a General insurance Company .The photograph was taken in July during his return trip to Kaingo/Mwamba. While not at work, he is actively and passionately involved in helping younger executives find their voice. Settings: Canon EOS 1D Mark III, 1/50 sec at f/5.6. Focal 560mm. ISO 1000.